Pápai Páriz Ferenc, Album amicorum p. 445. In London, on August 16, 1721. Pál Kamarási (Sárdi) was born in 1693 in Sorostély (Alsó-Fehér county, today Soroştin, Roumania), the son of the pastor György Kamarási. He learned in Nagyenyed (Aiud), then he went abroad. In 1717 he was in Franeker, in 1720 he immatriculatd at Leiden, in 1721 he visited England. 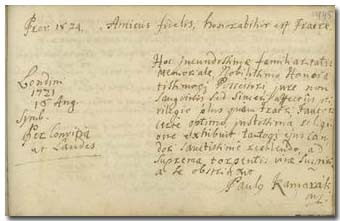 In 1723 he returned home, and was assistant pastor in Szászváros (Oraştie), then from 1730 pastor in the same town. He died on January 30, 1735 in Szászváros. His work is, besides his funeral sermons: Exercitatio … inquirens in veram punctuationis Hebraei textus antiquitatem. Leiden, 1722-1723. 4 tom. According to this note, in August of 1721 he was in London.